As with any research project, sometimes it's easier to find information from a backdoor. So, when I couldn't find a marriage record quickly, I turned to the divorce records. 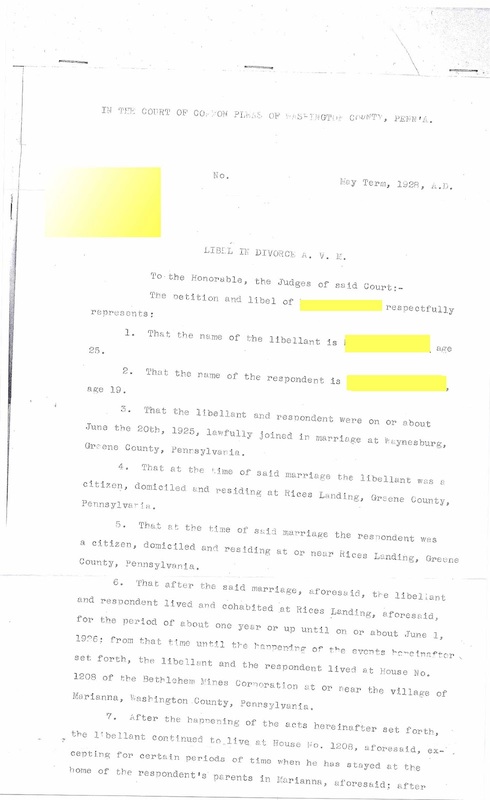 (The wife's second marriage record indicated "divorce.") Surely the divorce record would provide the date of marriage and where it took place. But so much more was located. 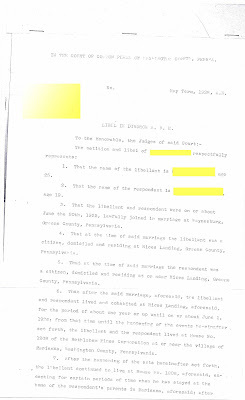 The 6 page legal document included not just the marriage date and place, the details of the divorce were outlined to include the reason: wife committed adultery; the name of the paramour; place of residence; place of work; and, dates and places of rendezvous': "in the home" and "in the wood near the home." My Wife Is An Infant! I gave a second glance at the sentence that declared the wife as an infant. What?!? Historically, infancy was defined as under the age of 21. In this case, the wife married at 16 years old and was still in infancy at the time of her divorce - 19 years old. The document further explains that the husband served as the guardian but for the purpose of divorce proceedings, he asked that the court appoint a "guardian ad litem for said infant." It's not often you see A.V.M (A Vinculo Matrimoni: translated from the bond of marriage) front and center on a divorce petition. But when adultery was involved, a divorce, A.V. M., often followed. This is seen frequently in Pennsylvania and New York. With the description above, there's no question why the divorce A.V.M. was granted. Further reading of the divorce papers explains the importance of A Vinculo Matrimoni. Today the term "absolute divorce" is used, granting the party the right to remarry. Historically, the guilty spouse could not marry the lover when adultery was declared. Subsequent marriages were allowed, but not to the lover. Plus, in many cases, the marriage was annulled as if it never happened. "Libel in Divorce A. V. M." May Term 1928. Court of Common Pleas of Washington, Pennsylvania. From the County of Washington Office of the Prothonotary, Washington Courthouse, Washington, PA; in author's file. Ancestors left their home places, families and the comforts of their language and community behind when they took the voyage to the new world. The world of hope was on the other side of the sea. Those who made the trip were processed at ports like Ellis Island, exiting to what should have been a land of opportunity. These were the lucky ones; albeit homeless, poor, and sick. Their luck often ran out as they exited the processing station. They needed shelter, food, jobs and healthcare, but they were often met by "runners" known as scammers, today. With little knowledge and a bit weary and desperate, they often fell into the trap of being exploited. With each flood of ethnic emigrations, new arrivals fell prey. That is until Immigration Societies began forming with the mission to provide the basic needs. Food, cash, housing and guidance was provided to the new immigrant. Some societies offered lists of upstanding businesses and care for children and women. Catholic Emigrant Societies. Visit the New Advent, Emigrant Societies for a listing of Catholic emigrant societies. Charitable Irish Society. In 1737 twenty-six men organized the Charitable Irish Society in Boston, Mass. The society collaborated "with the Irish Immigration Center and the Irish Pastoral Centre." Employment, housing, education, finance, health, and the law seminars were offered. Charitable Irish Society Records, 1737-2008 may be found at the Massachusetts Historical Society. Hebrew Immigrant Aid Society (HIAS). The HIAS, founded in 1881, provided meals, transportation, jobs and temporary housing for Manhattan Jewish immigrants. http://www.hias.org/ The American Jewish Historical Society (AJHS) collection includes immigrants arriving in Boston, Providence and Rhode Island, between 1870 and 1929. Arrival cards, individual case files, and passenger lists from the Boston HIAS are now held at the AJHS which has a collection of over 100 years. Emigrant Aid Society. The Emigrant Aid Society founded in 1841, supported Irish immigrants. In 1850, the Emigrant Savings Bank was founded to provide safe banking practices to include sending bank drafts back to Ireland. Records from 1841 - 1975 are held at the New York Public Library Manuscript Division. These records may also be found at the Family Search Library. Royal Philanthropic Society. In 1788 the Royal Philanthropic Society was organized "for the admission of the offspring of convicts and the reformation of criminal poor children." Mostly these children roamed the streets of Great Britain (majority in London) and parents had been either transported to Australia. or of Australian heritage. According to the website, this society housed, clothed, fed, schooled and apprenticed these children with the end goal that that they would become "useful members of society." The Admission, Discharge and Other Records, 1788-1890 can be found at the Family History Library. These records are not centralized. But the search for where they are housed is worth the effort. They are full of ancestral data. A good place to start for Immigrant Society research is at the Family Search Library website using the keywords "Emigrant Societies." Be sure to expand your search. 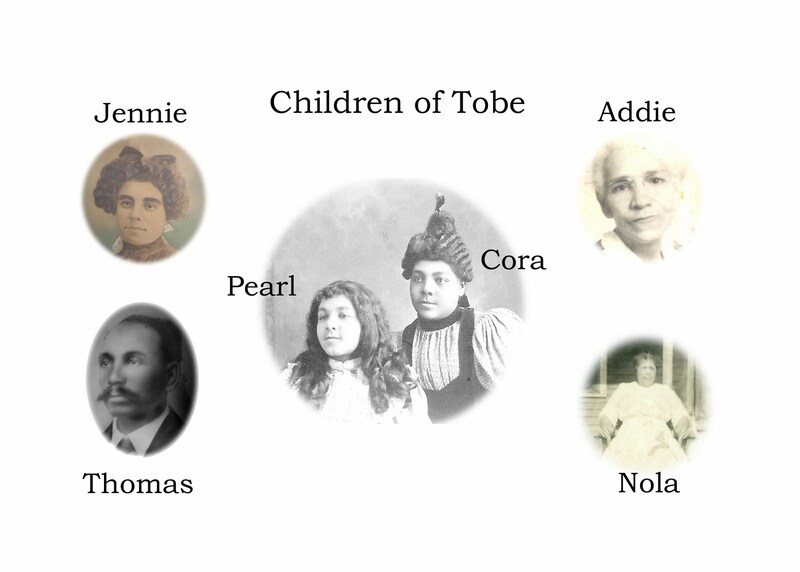 Don't forget your State Historical Society, local libraries and additional information may be found in Ethnic Genealogical Society collections, which may be found via a simple Google search (i.e. Polish Society). Recently, I read an historical-rich piece posted on the archives.com website: Civilian Conservation Corps: Records From the Great Depression Era penned by Diane L. Richards. It's funny how we are often so busy as researchers to stop and investigate how records become necessary. What was the impetus of such a collection? 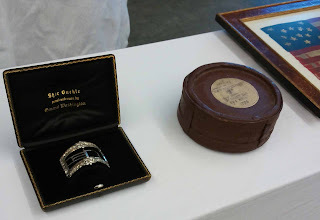 Diane gives us a great historical background of the CCC collection held at the NARA. Knowledge on the making of records increases our effectiveness as family researchers. In 2009, I posted Civilian Personnel Records at the NARA. The idea was to inform readers that the CCC resource was waiting to be tapped. I was on a quest to locate records of a Doctor that served on the Sioux Indian reservation. Like Diane's experience, I spent a while copying page after page of records. They included a photo, names of Russian parents, job promotions, and even his resignation letter. 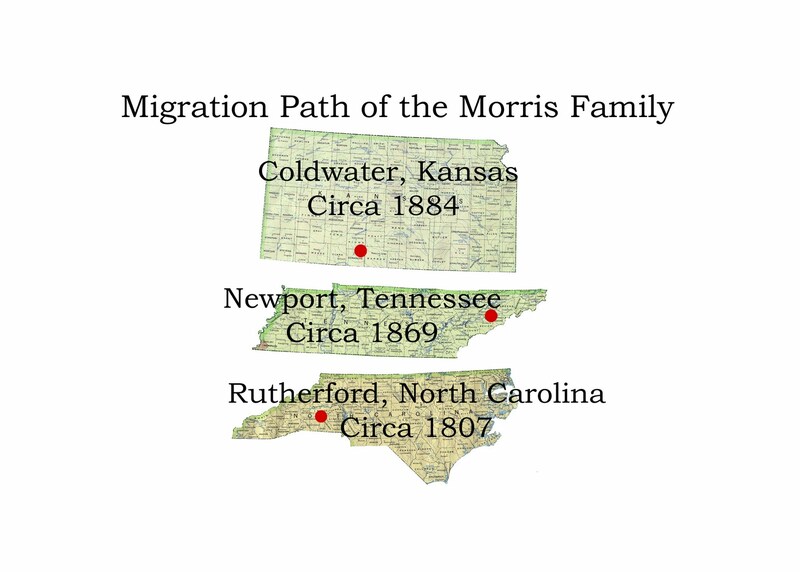 Information on his migration was embedded as well as other places he resided. I was ecstatic to find a client's ancestor within the CCC files, but surprised that a Federal government Indian reservations project was included. This job fell under the Department of Interior. Perhaps the element of surprise was from lack of processing the purpose of the CCC. But either way, the more researchers share their experiences with these records, the more it proves their versatility. Be sure to become familiar with these records and enjoy the free Learn From Expert series on the Archives.com website. 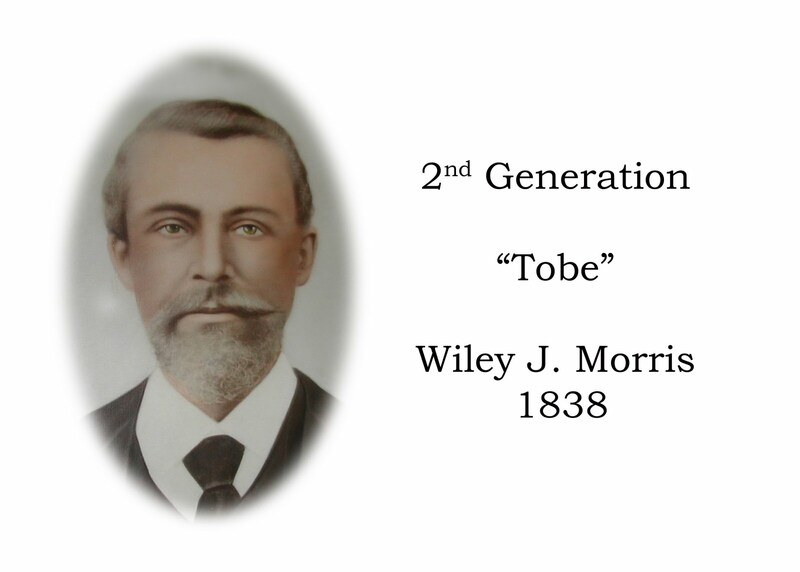 Email Question: I stumbled on a genealogy land oddity. My ancestor homesteaded section 16 of his township. The big question is who owned this land, and how did my ancestor get it? (Note: not complete quote from the email). Let's give a bit of background of land surveys. In 1779, Thomas Jefferson suggested that every county in Virginia be divided into 5-6 mile squares in order to support school efforts. In 1784 public land surveys were added which lead us to the 36 mile parcels of 640 acres or "Sections" of today. The Land Ordinance of 1785 established the method needed to divide and sale public lands. By 1785 lands northwest to of the Ohio River and west of the Mississippi river were all divided into 6 miles square townships. The 1785 Ordinance also included Section 16 of each Township be set aside for maintenance of public schools. This is to suggest that each township include a 640 acre School Land parcel, Section 16. Section 16 falls somewhere in the middle of each township. As in this case, the ancestor at one time actually owned Section 16. She asks: So the big question is who owned the land [...]and how did my ancestor get it? No time-frame was provided, but here are a few hints to begin your Section 16 or any land plat search for lands set-aside. 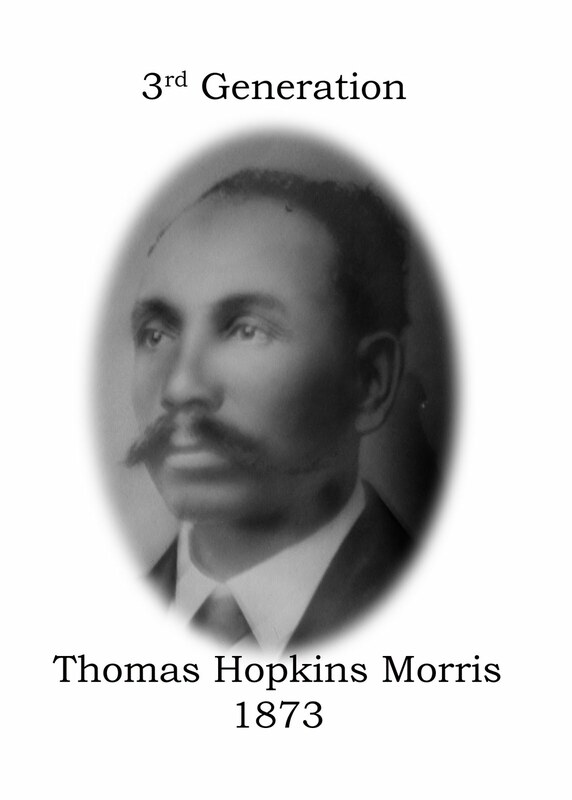 If your ancestor owned the land before the ordinance, begin with deeds, patents, wills, etc. But if he got it after the ordinance, you may wish to brush up on the states' laws. Some states bonded out land during the wars. This is often seen during the Civil War where many towns were desecrated. And although the lands had been previously surveyed, upon return to familiar towns or settlements of open lands, people "homesteaded" or squatted in Section 16 lands. This practice was not foreign during the War of 1812 either. Another reasonable answer: border changes. As town and state borders changed there was a blur as to the validity of previously surveyed lands. Re-surveying records may differ from the originals. These 3 suggestions may lead you to answers when researching Section 16 lands that were set aside for schools. 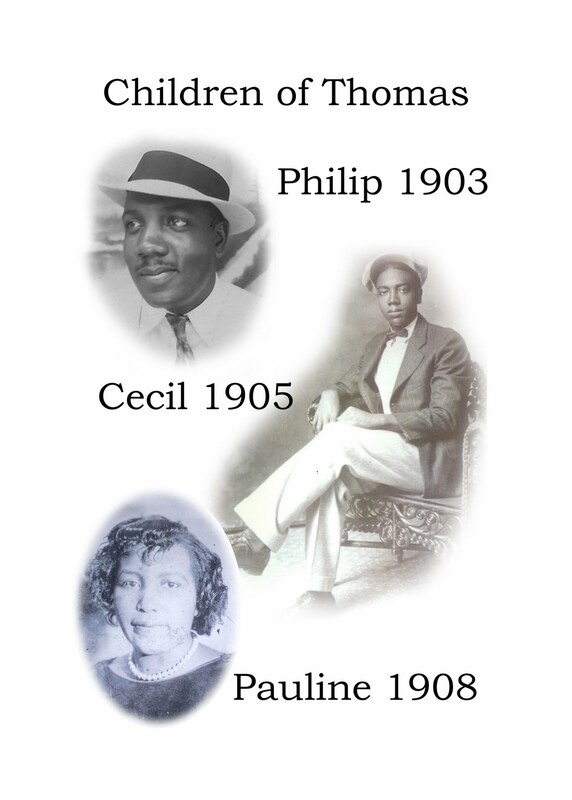 1) Determine year of acquisition by ancestor and review community history of city and state. Was this town devastated by a war or natural disaster and forced to be re-settled or resurveyed? 2) Go back to the deed book. Deed books may tell you how an ancestor acquired the land but you may have to go back (or forward) several generations. 3) Analyze plat maps and county formation maps to determine county and border changes. The Bureau of Land Management (BLM) "Our Record Keeping History" is a great place to find more information. In 2011 Americans of all colors, race and religion are free to join in the festivities of the 4th of July. Not to dampen the spirit, but we can't forget that in 1776 slavery was a welcomed institution even while the words freedom and rights were widespread. Colonies fought against the British forces in the Revolutionary War, 1775-1783, for such freedoms and rights that were not extended to slaves for another 80 plus years. In some states, like North Carolina, free-coloreds were allowed to serve as soldiers, others as laborers. Slaves, too, served as substitutes for white men. In exchange they were most often promised their freedom, as was my ancestor, Ned Griffin. An Act for Enfranchising Ned Griffin, Late the Property of William Kitchen. II. Be it therefore Enacted by the General Assembly of the State of North Carolina, and it is hereby Enacted by the authority of the same, That the said Ned Griffin, late the property of William Kitchen, shall forever hereafter be in every respect declared to be a freeman; and he shall be, and he is hereby enfranchised and forever delivered and discharged from the yoke of slavery; any law, usage or custom to the contrary thereof in anywise notwithstanding. As many as 10% of the Continental Army soldiers were African Americans. Ancestor Ned Griffin, served in The Battle of Guilford Courthouse, March 15, 1781. The following history is available on the History from the National Park Service, Guilford Courthouse website. Ned Griffin, a “Man of mixed Blood,” served as William Kitchen’s substitute in the North Carolina Militia. William Kitchen deserted the army prior to the battle of Guilford Courthouse and purchased Griffin to serve in his place. Hiring a substitute was a common practice for those who could afford it. In this case, Kitchen promised Griffin his freedom upon return. Griffin fulfilled his service (it is believed to have been at the battle of Guilford Courthouse), but Kitchen instead sold him back again into slavery [upon his return]. I say it with a sad sense of the disparity between us. I am not included within the pale of this glorious anniversary! Your high independence only reveals the immeasurable distance between us. The blessings in which you, this day, rejoice are not enjoyed in common. The rich inheritance of justice, liberty, prosperity, and independence bequeathed by your fathers is shared by you, not by me. The sunlight that brought light and healing to you has brought stripes and death to me. This Fourth of July is yours, not mine. You may rejoice, I must mourn. To drag a man in fetters into the grand illuminated temple of liberty, and call upon him to join you in joyous anthems, were inhuman mockery and sacrilegious irony. 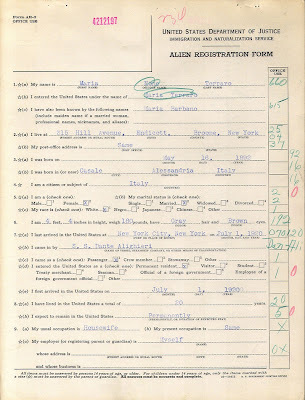 Did Your Ancestor Complete the 1940 Alien Registration? As I am unable to use my client file, this is a copy of a Sample Registration on the NARA Website. 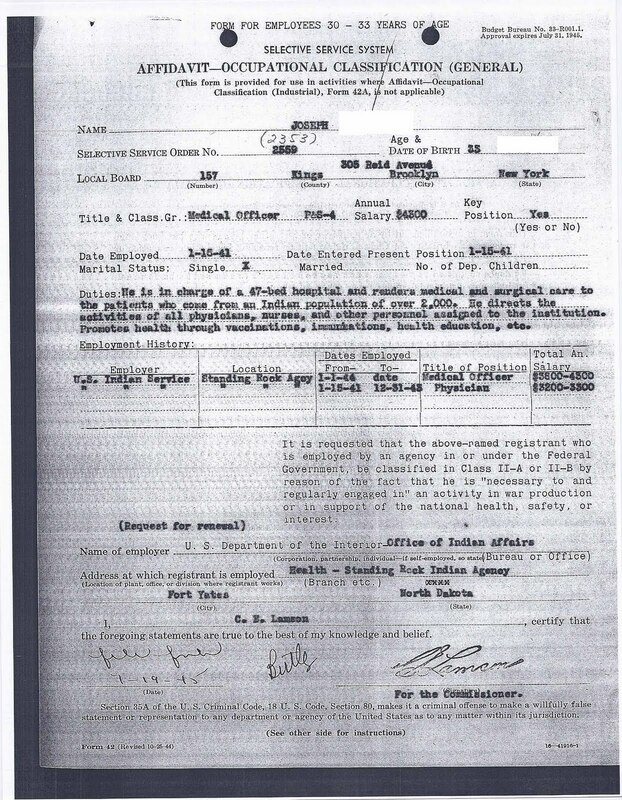 The Purpose and Process of the 1940 Alien Registration? Do not confuse the 1940 Alien Registration with the Enemy with the Enemy Alien Registration Affidavits from the WWI era (1917-1921). 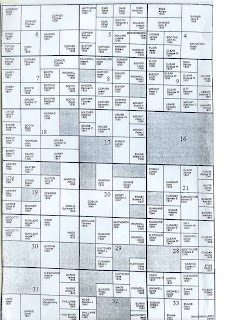 This Registration form was designed to take "inventory" of the country's resources. The KC National Archives and Records Administration (NARA) newsletter of July 2011 states the process best. The registration process included a questionnaire form and a requirement that fingerprints be taken at the time of registration (certain exclusions applied for diplomats, employees of foreign governments, and children under the age of (14). The Alien Registration forms may contain a photograph of your ancestor (alien). Their residence in non-census years, and country of origin may be included in the Alien file. 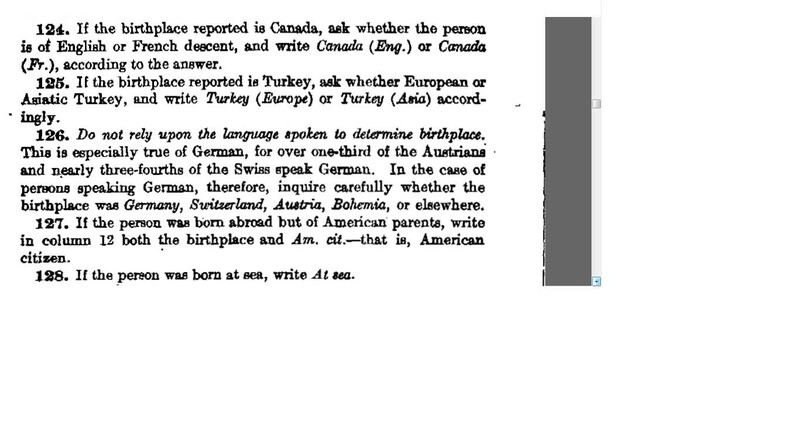 Plus, family historians may find copies of foreign birth certificates (some translated) and foreign marriage licenses. Other data that may be found on the Alien Registration forms are Alien Registration number, alias names, date of entry, parent's names, as well as the alien's naturalization information of the foreign born. 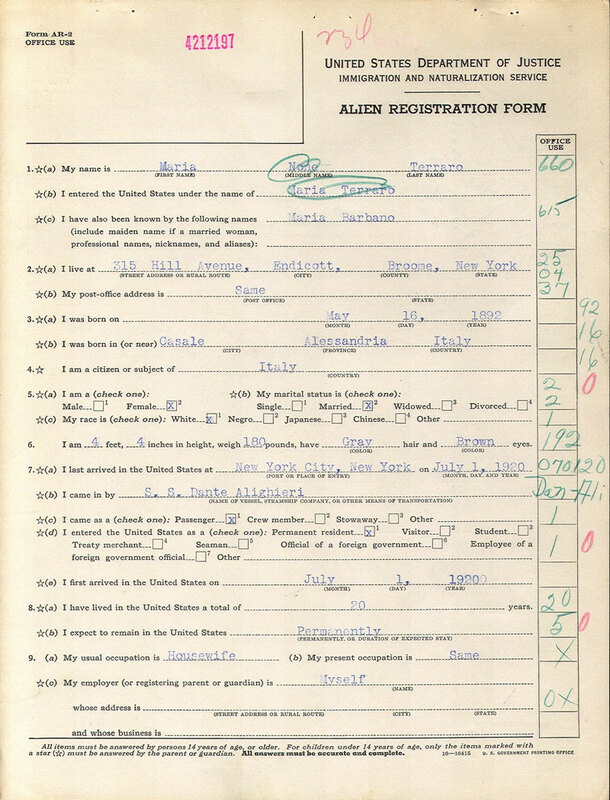 There were over 5 million Alien Registration Forms submitted in 1940. The National Archives maintains more than 350,000 of the A-Files of aliens who were born 1909 and prior. 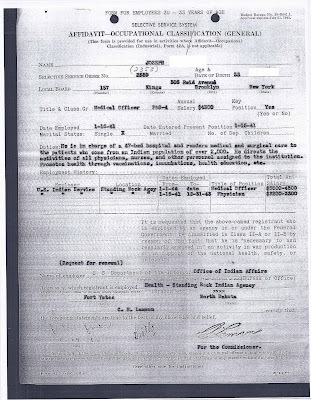 These files may be located in Record Group 85, Records of the Immigration and Naturalization Service. These documents have not been digitized, but OPA or ARC may be used to narrow down your ancestor's alien number by an inquiry of name, date of birth or country. However, not all of the A-Files have been accessioned to the NARA. The USCIS maintains all active and inactive A-Files that have not yet been transferred to the NARA. Researchers may also wish to go through the Genealogy Program of The United States Citizenship and Immigration Service (USCIS) office to locate an ancestor's Alien File. When working through the USCIS Genealogy Program, expect a lengthy delay in receiving documents. This program recently streamlined this program, and has made changes to its previous procedures. I found the 45 day process of yesteryear, to take 90 days plus to complete a recent transaction. But Voila! the documents have been received, with the genealogical treasures needed to close a client's case. 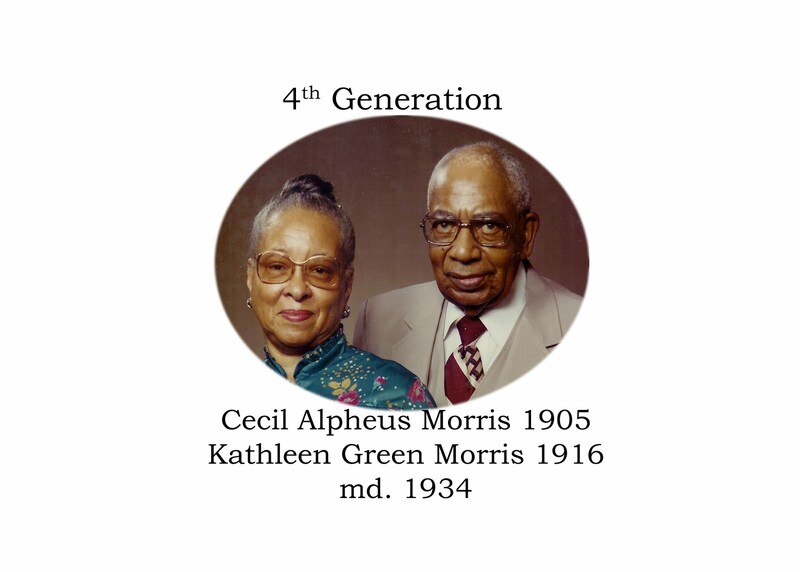 Another great resource for genealogy research! Unfortunately, family historians often fail to familiarize themselves with heraldic records and repositories. However, this is a valuable tool especially for early colonial researchers. Recently I penned Coats of Arms and Family Research for Archives.com, an online genealogy magazine, to give a quick primer on the value of heraldic records as a tool for family research. Of course, we are not referring to the local shopping center's "kiosk coat of arms" or "souvenirs" but an authentic, timely-registered coat of arms. Legitimate coats of arms are inherently full of genealogical data. By decoding the coat of arms, genealogists versed in the history of the twelfth to seventeenth centuries, can determine ethnic origin, class status, and social history of an ancestor using heraldic records and repositories. Most often I use heraldic records to distinguish families with common surnames, purge parasites from colonial genealogical trees, or to determine parentage, as well as home place and region. In Europe, paternal coat of arms were used for proper identification from 1250 and 1500. But from 1500 - 1750, on both sides of the ocean, a coat of arms was used as a status symbol, designating rank, landownership, wealth or fame. So, a legitimate coat of arms may assist in connecting an immigrant ancestor to his European origin. 1) Read Coats of Arms and Family Research published on the Archives.com website.